FS: USED Icon Eternal Sinner Helmet, Size Medium, "Adult Content"
I'm selling a used helmet in good condition. There is a small scratch on the left side on the top flame as seen in the picture. There is a small chip on the right side you can see near the knee of the graphic. I may or may not have the chin skirt for this helmet. The mirrored silver visor has some light scratches. The "Sinner" banner is removable, and this comes with 3 more pairs of stickers in addition to the set that is on it currently. Rarely these helmets will come up on ebay but are either in odd sizes, or have no stickers. Only 5,000 of these were made, and Icon has not made an "Adult content" helmet since. $480 obro + shipping from NY. Cash, Money Order, or Certified Check. Local pickup or delivery possibly available for NYC/Long Island. Re: FS: USED Icon Eternal Sinner Helmet, Size Medium, "Adult Content"
does the rack come with the helmet? CHEAP! New sick f4i cage and fresh icon helmet! 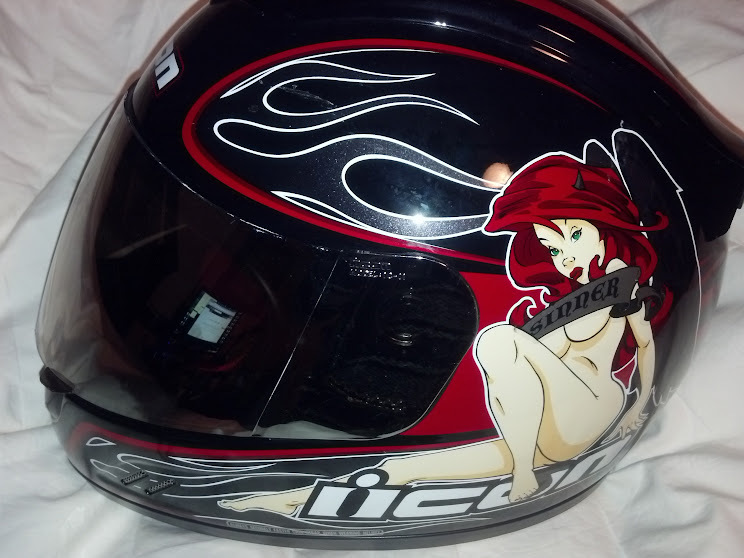 Quick Reply: FS: USED Icon Eternal Sinner Helmet, Size Medium, "Adult Content"